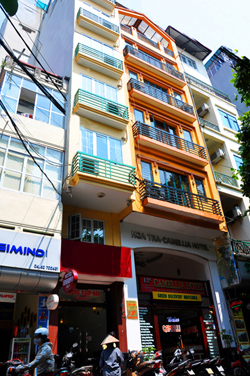 Camellia Hanoi Hotel CAMELLIA HA NOI Hotel has 7 floors, accessed by an elevator and all our rooms are well-furnished. CAMELLIA HANOI Hotel offers you more than a 2 star hotel. All the rooms in the hotel have wooden floors with big windows and are equipped with IDD telephone, air-conditioning, cable TV, refrigerator, comfortable bathroom (bath and hot shower), hair-dryer, ADSL Internet. Buffet breakfast is included in price. Come to CAMELLIA HA NOI Hotel, you will be very satisfied with our outstanding service. Featuring rooms with free Wi-Fi and cable TVs, Camellia Hanoi Hotel is located by Hoan Kiem Lake, in Hanoi's historic Old Quarter. It has a restaurant and tour desk. Elegantly decorated with classic wood furnishings, Camellia Hanoi's air-conditioned rooms have seating area and a safe. A fridge and electric kettle are provided. Private bathrooms come with a bathtub and hairdryer. Hotel Camellia has a business centre and provides laundry and currency exchange services. The tour desk offers one-day city tours as well as trips to scenic Ha Long Bay. Western and Asian dishes are on offer at Camellia's restaurant. Camellia Hanoi Hotel is about a 10 minutes drive from Hanoi Railway Station and 5 minutes from Bus Station. It is a 40-minute drive from Noi Bai International Airport.